My encounter with Kumaon happened by chance and I instantly fell in love with this heavenly abode. River Ramganga separates Uttarakhand in two divisions; Kumaon and Garhwal. My destination, Kumaon is to the north east of this river. The other part is called Garhwal. Mountains have always enchanted me. To me they are an epitome of humility - enormous, strong, tall yet calm and mysterious. 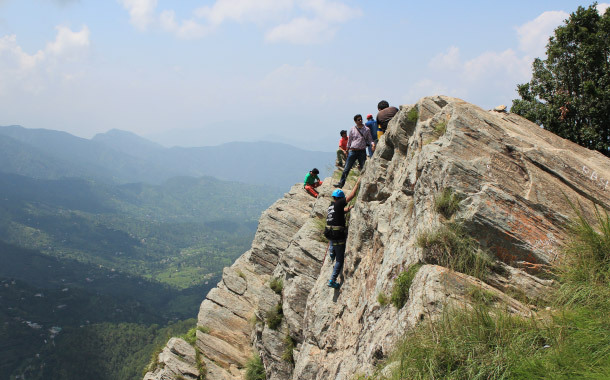 I've spent many a weekend climbing peaks on the Western Ghats and enjoying a bird’s eye view. Ergo, I was yearning for an expedition in the Himalayan paradise for quite a long time now. My flight tickets to New Delhi were booked and the prospect of travelling to North India for the first time thrilled me. With negligible research, I set-out on an unknown adventure in the Himalayas. - The Secret Life of Walter Mitty. I got down at Haldwani, a small town in the district of Nainital which is about 269 kms away from New Delhi. My arrival was welcomed by the pouring rains and I had to haul my way out of the furious crowd to meet Lalitji, a pahadi from the village of Sattal. As I sat in the jeep, little did I know that the Kumaoni adventure had already begun. My trip began with an adventurous ride up in the hills. It was pitch-dark and the lights emitted from the headlamps of the jeep were our only accomplice. It was an absolute dramatisation of a haunted scene. Imagine complete darkness on long winding mountain roads with heavy downpour of rains. Suddenly you see a flash of lightning followed by the sounds of thunder. The lightning reveals the deep valley and you discover that your vehicle is on the slippery edge. You catch a glimpse of the mountains in the background and you feel daunted. Yes, it was a scary ride, but an experience of a lifetime. I must give brownie points to Lalitji who drove adeptly even in the challenging conditions. Not only are you guaranteed a view of your life, but also you are taken through the most daring and adventurous narrow winding roads. The rains showered over Kumoans all night long and even the first light of dawn had to prune through the dense rain clouds to rise and shine. It was a beautiful sight to observe the sky change its colours only to give way for the golden sun dazzling in the sky. It was a perfect morning, the birds added a sweet melody to the pitter-patter of rains. Being a nature-lover, I chose to walk the entire trail environed by the vast expanse of dense oak, pine and deodhar trees. We reached a point, where one of the lakes resembled the shape of Garuda, sanskrit name for eagle. Garuda is also a mythological bird who is the mount of Lord Vishnu. Lalitji told us here, that the lake was thus called the ‘Garud Tal’. He told us that Sattal was indeed a confluence of 7 lakes-Ram Tal, Laxman Tal, Sita Tal, Bharat Tal, Hanuman Tal, Nal-Damayanti Tal (a man-made lake) and Garud Tal. I traversed through the coniferous forests and reached the Sattal Christian Ashram which was built by revered Stanley Jones. I was lucky enough to catch a glimpse of members of a youth club singing in a chapel just next to it. Young hearts of all faiths came together to sing, dance and recite excerpts from the Bible. It was here in these hills, that I saw a candle of faith enlightened. At night in our campsite, we were served a simple home-cooked meal that was packed with lots of flavour. We played antakshari and rollicked over the anecdotes created through the performances in dumb charades. The night was abuzz with melodious Kumaoni songs sung by the pahadis around the bonfire. After a round of instructions, a friend and I sat in our two-seater kayak to row our way through the still waters of the Sattal lake. Left-right-left-right-and so on we went paddling on the lake. Just like the kayak, I sailed through my fear of water too. I also floated in the water for the first time, thanks to the life-jacket provided to us for kayaking! This is one of the easiest adventure sports that anyone can ever do. Suspended on a pulley, I zoomed over the the vast green pastures on to the other end. One needs to just hang on and enjoy the view. The lush greenery is a treat to the eyes. We travel to different places only to grow as humans; and yet again, we rediscover ourselves in new places. The road trip to Mukteshwar is a trip that no camera can capture what your eyes see. 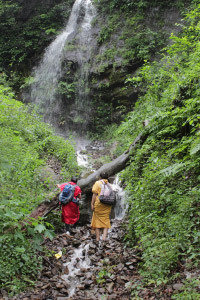 It is an immensely scenic journey skirted with deep and profusely green valleys. The breathtaking view of higher Himalayas will leave a lasting impression on your mind. A beautiful green valley and a deciduous jungle surrounded our campsite. Sunflowers danced to the gleam of the sun and bright-coloured butterflies fed on its sweet nectar. Rock climbing is a significant activity for a mountaineer. You would have an advantage if you are tall. Nevertheless, anyone can do it easily. You need to secure yourself with adequate footholds and handholds. At anytime, either of your 3 limbs must be perfectly placed and using the strength in your arms and legs, you need to pull yourself up to climb the rock surface. The trick is to shift the weight of your body from one limb to another quickly or the entire body weight comes on one part of your body. After successfully completing rock climbing, Avjitji, another Pahadi who managed our campsite, offered me rhododendron juice which energised me in seconds for my next activity. It has a refreshingly woody, sweet and sour flavour and is made out of the buransh or rhododendron that is endemic to the Himalayas. Chauli ki Jali are overhanging cliffs that bear a natural lattice work on the rocks. One of the tips jutting out of the rock (chauli) has a hole (jali) in it. Legend has it that if a barren woman peeps out of the hole, she is blessed with a child. 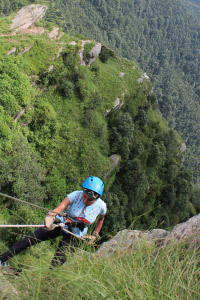 Rappelling at Chauli ki Jali was the highlight of my trip. I went numb as I was harnessed. ‘Feed the rope from behind and let it slide through the device from ahead’, Mahi, the multi-talented Pahadi guided. “Never bend your knees or you will lose the form. Go as flat as you can.” So I did and within no time I was half-way through. I left the rope and let my hands wide in the air- I was possessed by the colossally green valley 2,000 meters down-under and the Himalayan ranges forming a necklace over the horizon. Truly, a traveller sees what he sees, the tourist sees what he has come to see. Most of my childhood was spent in watching Ramanand Sagar’s Ramayan and B.R. Chopra’s Mahabharat. After every episode, I made my grandmother narrate the stories again. Ever since, I have longed to learn archery. My eyes glistened when I saw the bow which was approximately 4 feet 5 inches long. Feeling strong and powerful like Ekalavya, I was all set to hit the bullseye. After a few trials, I learnt the trick and managed to hit close to the target. The trick is to pull the bow-string as far as you can, ideally near your nose and then release with full power. It was the ending of the trip, but not the journey. On my way back, I packed some delicious chocolates from ‘Chocolates Delights’ in Mukteshwar. Kumaon was a serendipitous experience, a fascination that shall linger in me forever.